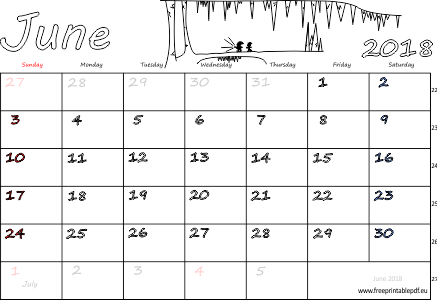 Calendar for the June 2018 in three PDF versions (blank, US and UK) for printing and coloring. Black and white version and a version with color Saturdays and Sundays. These calendars are perfect for children. Can be used like monthly planner. Theme: dwarfs in the cave.